Unlike living in a house where, apart from considering things like the odd fire hazard and the occasional safety issue here and there, for example, you cannot take as much for granted when it comes to safety issues when living on a boat. Although a boating lifestyle can be tranquil and a perfect antidote to the stresses and strains of conventional everyday life, there are far more safety considerations that you’ll need to take into account. Operator inexperience and/or inattention, carelessness, excessive speeds and alcohol impairment are just a few of the many issues that compromise safety onboard and one of the best things you can do before taking up life afloat is to undertake a recognised safety course as, in doing so, it can help you remember not only the importance of safety but what to do in the event that things go wrong. Remaining alert is perhaps not something that will particularly encapsulate a stress free boating lifestyle but, over a period of time and once you get used to living afloat, it will simply become second nature. Here are just some of the basics to help you keep safe onboard. Make sure that your boat has all the necessary safety equipment onboard which is appropriate for the type and size of craft and number of people it is carrying. This includes things like lifejackets, lifebelts, liferafts, fire extinguishers, flares and signalling devices, radio and other forms of communication etc. Remember too that because a boat is situated on the water and exposed to the elements of the weather in a very different way to which a conventional house is, that you maintain the upkeep of your boat and have regular checks for things like corrosion, excessive wear and tear or potential leaks, electrical cabling, gas and other fuel supplies and their safety and storage. Take a course which will teach you how to become a proficient skipper as well as taking recommended safety courses. In doing so, not only will you be more confident in the basic boating techniques of steering your craft, speeding up, slowing down and mooring etc., you’ll be able to pass on these skills and good practices to others who are living or travelling on the boat with you. Become familiar with boating etiquette. This isn’t simply about courtesy on the water but will also aid safety onboard too. There is another article about this contained within this website. It’s important that you respect the weather and the effect that it can have on water conditions, particularly out on the open seas and oceans. No matter how proficient you are as a sailor and skipper, do not put yourself or other people onboard at risk of their safety by sailing when the conditions are not conducive to it. After all, you can always delay a trip by a day or a few days and whatever inconvenience that might cause, it’s far preferable than putting your own personal safety and even your life and those of others at risk. Whichever type of boating you intend to do and wherever you intend to do it, there will always be the need for rules and regulations as set out by organisations which permit you to sail or boat on a particular stretch of water. Make sure that you follow these rules as they are set out. They are not put in place to curb your enjoyment but are there for your safety and the safety of other boaters and sailors alike. When living on a boat, safety must always be your number one priority above everything else. 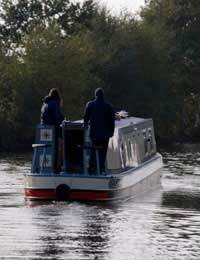 By following the general advice contained here and in other safety related articles contained on this website as well as the vast range of resources on the internet and in book stores relating to safety onboard, you can be assured that your boating experiences will become more enjoyable and far more likely to be trouble free. Some simple things like being aware of fire hazards, regularly checking the hull of the boat (inside) for leaks and so on are all part of being safe on a boat. Also, you should wear a life jacket all the time you're up on deck, and if below deck have it in easy reach (not for canal boats, of course). Check any dinghy or lifeboat to make sure it's seaworthy and have your own vessel professionally inspected on a regular basis so any potential problems can be identified early.